The problem is that there is too few doctors in the market. The American Medical Association acts as an cartel by blocking entry into the market. DEAD Weight Loss: This is the area represented by the medical treatments that did not happen because patients were unable or unwilling to pay for Price1. NOTE*: The difference between Q* and Q1 might represent a huge difference as patients make decisions regarding their medical condition based on an inflated price. This might look like a better outcome, but it is not. DEAD Weight Loss: Dead weight loss2 relative to dead weight loss 1. We don’t know. We do know that Q2>Q1. NOTE*: So, you ask? Why aren’t patients better off? The problem lies in how and why the demand curve shifted out. 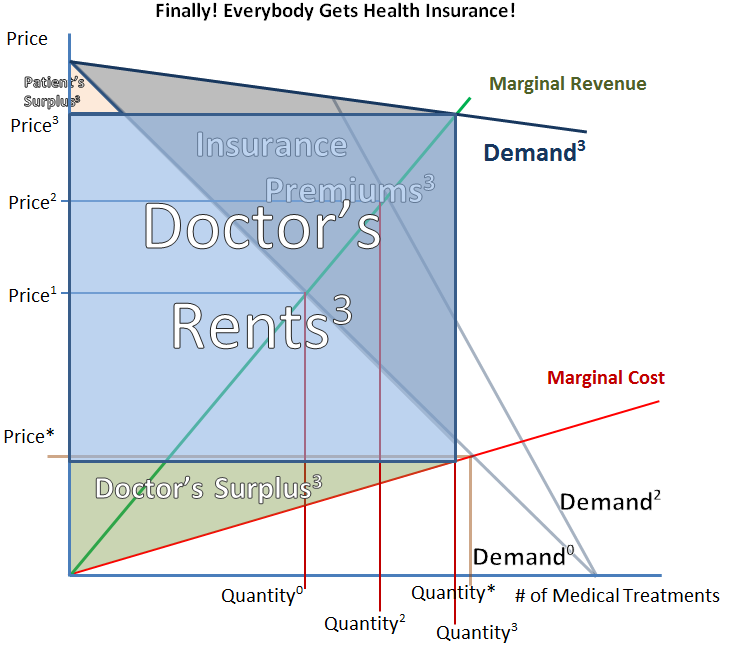 The demand curve shifted out because people are instead paying yearly premiums distributed across all health insurance consumers. We know that there is no way on average people are going to receive more value from health insurance than they pay. Therefore, though they pay less per treatment, on average people pay more for health services because of health insurance. However, politicians observe people who receive health insurance through work and find these people to be very happy. This is because for those people who receive health insurance through work, this is the equivalent to a lump sum transfer or payment. So, politicians say, one way to make people happy is to give them health insurance. Thus recent medical reform. 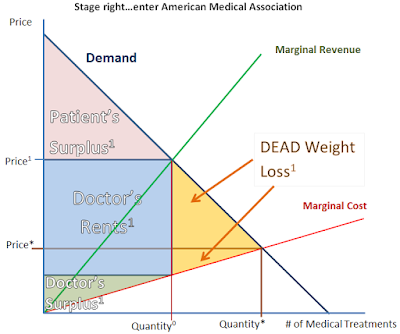 DEAD Weight Loss: We cannot directly observe the dead weight loss in this graph. However, if you keep in mind that the average commission by insurance companies is upwards of 20% (as high as 50%) of what you pay in premium then you can be pretty sure that all of that extra cost is not a good thing. So, why is this a bad thing? Q3 is close to Q4, it might even be greater. So hopefully less people will die and live in discomfort because of lack of medical services. Sure, people in general are unhappy with how much they pay for insurance but ultimately that is mostly a direct transfer to doctors which are much happier. Is this a problem? Yes! Currently the US spends 13% of our GDP on health insurance. This is 4 times as much as other national on the planet. This rate is only growing as health insurance becomes mandatory. Simultaneously a larger portion of the population is growing elderly which corresponds with much higher rates of illness and higher medical costs. The status quo of many people being unable to afford health insurance is not ethically viable. 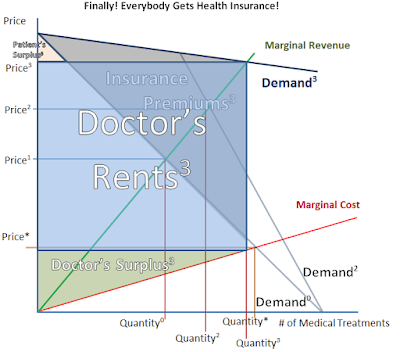 The alternative proposed of everybody receiving health insurance is not economically viable. In what kind of a world do we live where a person could spend his/her entire life savings paying for a single operation that costs 2 to 10 people 5 hours of their lives? I always knew intuitively that mandatory health care insurance will lessen the effective value of health care receipts, but I have not been able to present my intuition graphically. So, thank you for your presentation. 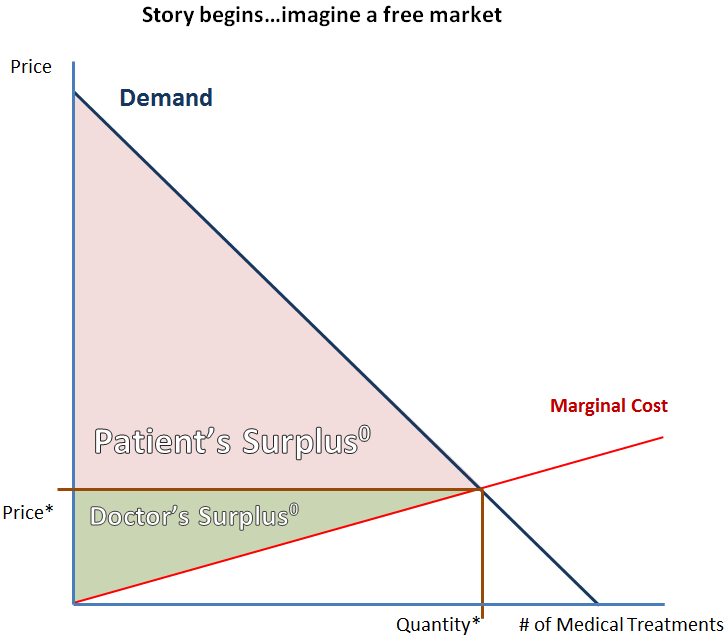 I'd also add that although the Patient's surplus reduces with each successive health care program, the Utility the Patient derives from such programs increases or stay the same. This is because, as you said, people are happy when they receive health insurance through work. Hence, the reason why it is politically attractive to establish health care programs. 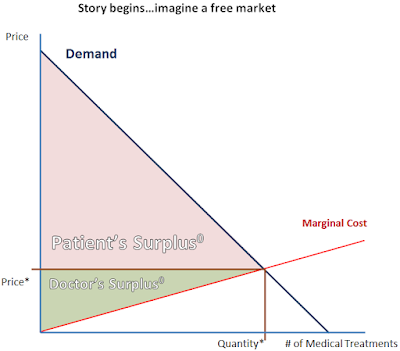 There is a lot of evidence that health care purchases are not well modelled by the type of supply-demand curves you propose. 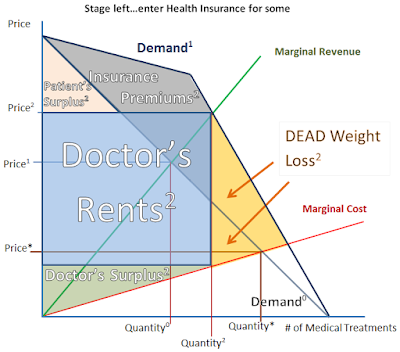 Health care is not a consumer good. There is a small risk that anyone will incur ruinous health care costs. In the US system, this risk is higher than most other places because of rent-seeking by doctors, hospitals, insurers and drug companies (mostly). To manage this, most other countries go to highly restricted, tightly regulated, markets. To suppose that your current mess is due to the evil AMA restricting doctor supply is just silly. The US has gone further than most other places in allowing other people to provide healthcare. The main issue is the excessive profitability of insurers. Doctors are kept quiet by a share of the rents. Finally, you suggest that it is absurd that an operation lasting a few hours could cost a life savings. I agree that it is immoral, but it is not absurd. Many operations last less than an hour, but the costs of spending days in hospital, the costs of complications, of drugs, of transfusions, and so on, all mount up. The actual procedure costs are often a small fraction of the total costs. Anthony, I differ to your superior knowledge in this matter. I have no serious background in health research. I just write based on personal observation and this seems to be what has been happening in the US to me. I am pretty sure that part of the provision of the Obamacare law is that insurance companies must maintain a relatively small top margin on premiums. Do you think this will therefore be sufficient to correct the rising health care crisis in the US? Presentation of doctors and patients demand and supply is clearly spoken. Finally we have got the dead weight loss of it. It helps to get full idea of it. Thanks! !